As the official flu season begins, it’s important to find ways to keep illness at bay. While the impact of the flu can vary, there is no doubt that it places a substantial burden on the health of millions of people in the U.S. every year. The Centers for Disease Control has estimated that influenza has resulted in between 9.2 million and 60.8 million illnesses, between 140,000 and 710,000 hospitalizations and between 12,000 and 56,000 deaths annually since 2010. While It’s not possible to predict what this flu season will be like, your main concern is probably keeping illness away from you and your family. You’ve been doing everything you can to avoid catching an illness at the office, even when it’s spreading like wildfire, and you’re careful when you’re out and about too. But then it happens. Your child, your spouse, a roommate or someone else in your household comes down with the flu. Those germs can spread quickly, even before symptoms appear. Using antibacterial soaps, wipes and the like isn’t going to work, in fact, it could make things even worse. Researchers have found they may spread, rather than kill, bacteria. In 2008, a study out of Cardiff University in Wales looked into the ability of antimicrobial-surface wipes to remove, kill and prevent the spread of infections and discovered that the pathogens spread after only the first use of a wipe, primarily due to the ineffectiveness of wipes to actually kill bacteria. The experts discovered that all of the dirty wipes, including those with the disinfectant, still had some bacteria remaining on them. When they were reused, the wipes simply transported the bacteria to another location. So forget about that advice you read that tells you to use these wipes to get rid of germs – it’s rampant on the Internet, but it’s simply not true. And, what about those store-bought household cleaning products? They’re not only pricey, most are packed with potentially hazardous chemicals – in fact, the average household contains some 62 toxic chemicals, according to environmental experts, many of which have been linked to asthma, cancer, reproductive disorders, hormone disruption and neurotoxicity. 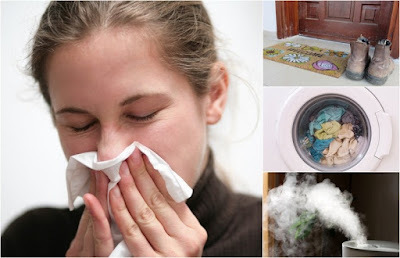 Instead of ineffective and potentially harmful wipes or other chemical-filled products, use these ideas to naturally flu-proof every spot in your home. Flu viruses can live for up to eight hours on hard surfaces, which is why so many people get infected by touching things like germ-filled doorknobs and light switches. Spray them down regularly by combining one tablespoon of white vinegar to every 16 ounces of water in a spray bottle. Dry using paper towels rather than a sponge, which only serves to transfer more germs. If someone is sick at home, be sure to disinfect daily. It’s a good idea to do this with other places germs tend to accumulate as well, like faucet handles and countertops. For tough areas, including your sink, dip half a lemon in baking soda, and then scrub directly. Wipe down with the vinegar spray and then dry with a paper towel. Cutting boards are breeding grounds for germs. While the question of whether wood or plastic is a better surface for them is more about food-borne pathogens than a flu virus, it’s worth noting that germs of any kind can live on either one. Still, the Food Safety Laboratory at the University of California at Davis leans toward the wood. Plastic cutting boards can go into the dishwasher, which is why many people like them, but when washing by hand, a knife-scarred plastic cutting board is going to be able to hold tightly onto any bacteria, while a wooden cutting board does not. Plastic boards must be washed in a dishwasher. For your wooden board, use the tough natural cleaning solution as noted above: dip half a lemon in baking soda, and then scrub directly. Wipe down with the vinegar spray and then dry with a paper towel. Wood furniture can be cleaned using the solution of two cups of olive oil and the juice of one lemon. Combine it in a spray bottle, and then spray the solution on the wood using a soft cloth and wipe clean. If your baseboards and walls have gotten grimy, dissolve a half cup of borax in a gallon hot water and then use it to wipe down those areas. If your sink is filled with dishes that someone sick has used, be sure to load them into the dishwasher on the hottest setting possible. Heat kills germs, so if you don’t have a dishwasher, handwash them using the hottest water you can tolerate. Cell phones and remote controls have been found to be one of the germiest things in the home. Just think about it, what does someone do when they’re ill at home? They usually cuddle up in the blankets on a couch with the remote control, and all of those nasty organisms get in the cracks and crannies, says hygiene expert Charles Gerba. Of course with those items, you don’t want to spray them down with liquid, but you can make your own natural yet powerful disinfectant wipes using vinegar combined with other natural cleaning ingredients. An empty container (an old baby wipe container works great) or one like this. Fold and place the cloth squares into the empty wipe container and then set it aside. In a mixing bowl, combine the water, white vinegar, and all three essential oils. Stir until thoroughly mixed. Pour the mixture over the cloths in the container, allowing them to soak up the solution. After a few minutes, they should be ready for you to pull out and use just like a store-bought wipe. To clean remote controls, use a dry cloth or vacuum cleaner with an appropriate attachment to remove all visible particles. Then swab it using one of your natural disinfectant wipes. For cell phones and table covers, remove the cover from the device and use a dry cloth first, removing all visible particles, and then wipe it down with a homemade wipe. You can do the same with video game controllers and keyboards. While resting on the couch is a good idea when you’re sick, it also leaves those throw pillows quite germy. And, even if there is no one in the house that’s been ill, tossing them into the dryer once a month for about 15 minutes on a hot cycle can help. It will also decrease dust mites and pet dander. Of course, an ill person is probably going to be spending a lot of time in bed too, which means that bedding will need to be washed in hot water and dried on hot too. Even when no one is ill, pillowcases should be washed once a week, and sheets at least every other week. The bathroom obviously gets very germy too. For a toilet, combine two teaspoons of tea tree oil to two cups of water in a spray bottle. Spray around the inside rim and then allow it to sit for 30 minutes before scrubbing. You can use a mixture of vinegar and water in your shower and tub too. As some areas of the bathroom can be difficult to clean, you may need an even more powerful cleaner for those. This recipe is ideal for those tough-to-clean spots. Combine the Borax, washing soda, castile soap and white vinegar in a large bowl, slowly add the hot water and stir. Allow the mixture to cool, and then add the essential oil. Pour it all into the spray bottle using a funnel. Do you have a desk at home? If so, you should know that it might contain up to 400 times more bacteria than the average toilet seat, according to a study by the same germ guru mentioned earlier, University of Arizona’s Dr. Charles Gerba. To clean yours and prevent any bad bugs from getting transferred to your hands, be sure to thoroughly wipe down the surface of your desk with the vinegar/water mixture. If you have one at work, you may want to do the same with your desk there. When one or more of your children has been sick, it’s a good idea to wipe-down toys and other items they’ve touched with your white vinegar/water spray bottle, or those homemade disinfectant wipes. For soft toys like stuffed animals, many can be tossed into the washing machine, just be sure to check the tag first and always air dry rather than placing them into the dryer to avoid a potential disaster. Comparing 30 years’ worth of climate records with health records, Jeffrey Shaman at Columbia University and his colleagues discovered that flu epidemics nearly always followed a drop in air humidity. That’s because whenever you sneeze or a cough, a mist of particles is expelled. In moist air, those particles may remain relatively large, and drop to the floor. But in dry air, they break up into tinier pieces that eventually become so small that they can stay aloft for hours or days. That means that in the winter, you’re virtually breathing in a cocktail of dead cells, mucus, and viruses from anyone who’s been in the room recently. Using a humidifier can help create a more inhospitable environment for the flu – just be sure to keep the unit cleaned regularly, or it can breed bacteria. Flu viruses and bacteria can thrive in mud, dirt, and debris, that can easily be stuck onto your shoes. Once it’s there, the germs that live in the treads. That’s why it’s a good idea to keep a clean doormat outside of every entrance to your home. Have everyone wipe their shoes down and then remove them as soon as they enter the house. Wash the soles of your shoes regularly using hot, soapy water regularly as well.